What happens to a democracy when its journalists and artists are too afraid to criticise those in power and express themselves freely? This is one of the questions we ask Vilma Vargas – a rising talent in the Ecuadorian art scene who was twice selected for the “World Press Cartoon” in Portugal and awarded first prize at RESET 11.11.11 in Mexico for best caricaturist. Under the current Ecuadorian president Rafael Correa the coerced closures of numerous media stations that do not comply with the new Law of Communication as well as lawsuits seeking millions in damages against journalists, some who have been forced out of work and threatened with imprisonment, physically assaulted and had their family homes raided at gunpoint by government officials have all contributed to what Vargas calls “one of the gravest moments” the free press in her country has ever faced. This however hasn´t intimidated Vargas into censoring her outspoken style and while other Ecuadorian journalists have become fearful of rocking the boat her caricatures stand out like a Cotopaxi-sized-pimple on President Correa´s chin. Chekhov: When the newspaper El Comercio asked six artists to draw a comic with the theme “If Superheroes lived in Ecuador” you where the only woman selected. Does that mean there are 5 male artists for every female or do you think artists of your gender are often overlooked? Vilma Vargas: Ecuador is characterized as having several renowned artists, as well as many caricaturists. Unfortunately in the realm of graphic humour there are some women who remain in the shadows and very few who have won a place in the press. But in graphic humour like it is in other areas: women are still relegated to second place. Also history has always been written by men. In the history of art, there exists several women artists, sculptors, philosophers, between other important women that have also been looked over. Chekhov: What advice can you give to younge female artists searching for their artistic voice and fighting to be noticed in the world? Vilma Vargas: I believe that in my country, women and people in general are more worried about how to solve their basic needs than perform some type of art. However people who do choose to have an artistic vocation should know that art is a way of life where you need to embrace risk and to express yourself is the best form of freedom. Chekhov: Then for art to become a lifestyle you need to focus on it 100% which is one of the reasons you left your career in architecture? Vilma Vargas: I believe it was more of a necessity. Passions sometimes impose and its necessary to renounce certain areas of your life to focus on creative work. But I haven’t abandoned architecture completely, its just that “art” wont let me abandon it at all. Chekhov: Do you receive enough from your caricatures published in the newspaper Hoy to support this lifestyle or do you need to find other sources of income? Vilma Vargas: Like you know, the press is passing through one of its gravest ever moments because of government harassment regarding freedom of expression and that has affected various media outlets, including the newspaper where I work. I live off my drawings, illustrations, and ceramic murals. Chekhov: One of the major themes to your work is Freedom of Expression, can you tell us the meaning behind drawings of yours like the one of Press Freedom being attacked by bats? 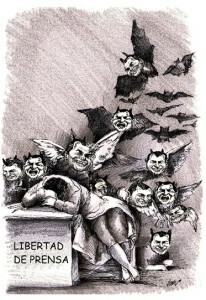 Vilma Vargas: That drawing is based on an engraving by Goya called: “The Sleep of Reason Produces Monsters”. – What I wanted it to represent is the press being attacked by various shadows. The worst part is reality is not like the caricature, if you have a different opinion you will not be disturbed by innocent bats but with the entire weight of the law which almost always responds with the interests of the Government. Chekhov: What happens to a democracy when journalists fear investigating and criticizing those who are in power? Vilma Vargas: First there wouldn’t be a democracy, because if not, you wouldn’t be afraid to have an opinion, to criticize others or yourself. The latent risk with these measures and pressures and media laws that infringe on our freedoms is that journalists and news media will start self-censoring, which impairs peoples ability to get information or adequate research on various topics. 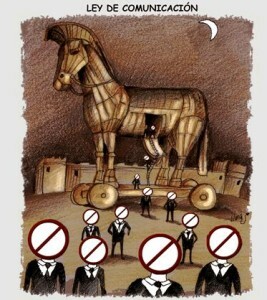 Chekhov: What is the new Law of Communication in Ecuador like and in your caricature who are the people in suits and ties coming out of the Trojan horse? Vilma Vargas: Even before the implementation of the “Law of Communications” there was some pressure and harassment through various means. Now the only thing its done is “legalize” these practices. In the drawing I represent a law disguised as a gift which is lawful but inside swarm several beings that already have incorporated prohibitions in mind. Chekhov: Can you tell us about the correlation between what is happening on the national level with respect to the journalists who fear criticizing president Correa and how that has empowered politicians on the municipal level to threaten, harass, and force out of work journalists who are investing municipal corruption like Ignacio Ramos Mancheno? Vilma Vargas: The problem is that the government only believes in what they say and they put together an entire strategy on the Saturday TV Broadcast Chains to convince us of “their truth”. Thus, it is normal that there are lots of clashes with voices outside of the ruling party. The former mayor of Riobamba, Juan Salazar, in jail under investigation for corruption. I don’t know very well the story behind Ignacio’s case, but its clear that like many other people working in the press they have closed the doors on him for not agreeing with the powers that be. Graphic humour is monitored as well, we can already see cases where caricaturists have been mentioned in the Saturday TV Broadcast Chains. 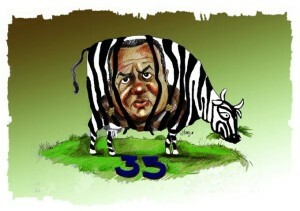 Chekhov: Can you tell us about my favourite caricature, The Zebra Cow, and how social networks helped spread messages like this caricatures and other images from citizen journalists in their fight to unseat and imprison the former mayor Juan Salazar on corruption? Vilma Vargas: Its been a long time since I touched the themes of my city owing to bad experiences I had with the directors of a certain newspaper that censured my drawings, however given the importance of the issue, I was again expressing my opinion about the city and from that came the drawing of the mayor from which I understand did not offer any grace to his followers. 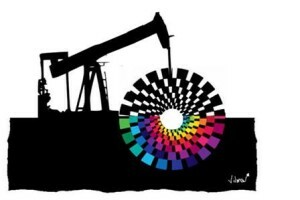 Chekhov: Recently a lot of your caricatures are focused on President Correas decision to drill inside the Yasuni National Park for oil. Can you tell us your feelings about the Yasuni and if you had the opportunity to visit it when you were painting the mural for the bus terminal at Coca? Vilma Vargas: In effect, I had the opportunity to paint the Mural of el Coca and see the breathtaking nature we have. The city of Coca is a population that has been generated because of the extraction of petroleum. Concerning the refusal to conserve the Yasuni is not up to the government to decide, its a decision of the country, its something that concerns us all. With this news the world will realise that we have a government that doesn’t give priority to conserving the natural wonders of Ecuador. Chekhov: After the journalist Emilio Palacio wrote that President Correa was a dictator he fled to the United States where he received political asylum to escape three years in jail and 4 million dollars in damages. 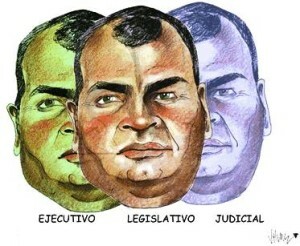 If you continue to draw caricatures of President Correa like the one with three heads that represent the Executive, Legislative, and Judicial branches of government have you thought of the possibility that one day you to might have to leave the country if you wish to continue expressing yourself freely? Vilma Vargas: To report and make art or say what one thinks always brings risks. To be free and feel differently too. While my lucidity has permitted me to continue drawing it may sound counter-intuitive, but the worse the country gets, the more work there is for us caricaturists. The lady and you should be responsible and tell the truth: 1 – Mayor Salazar achieving political support from various parties, including the government, but his party was the Municipal Movement. 2 – In Ecuador there is freedom of expression. Emilio Palacio not tell left Ecuador for Ecuadorian President dictator but because he said “crime against humanity”, which could not prove at trial and, conversely, the judges ruled that it was a statement “malicious and reckless” for this reason the President will start a trial. Palace took refuge in USA. 3-Ecuador is the largest economic countries and that more reduced poverty and inequality, according to the UN and CEPAL. Ms. Vargas is faithful to the editorial line of the newspaper, advocate and expression of oligarchic powers, enemies of the positive changes today. Hi William, I believe you have misunderstood because no where is it mentioned Salazar is from one party or the other. What is happening around Ecuador at the moment is that municipal governments of any allegiance/party/persuasion are mimicking the extremely belligerent stance the national government has taken towards its journalists who do not kowtow to the official line. This is what has created the culture of impunity for municipal politicians around the country as is evident in the case of the former mayor of Riobamba Juan Salazar. As per your second point you need to follow the links from IFEX.org and Reporters Without Borders in the third paragraph. Point no. 3 – I agree – Correa has done some great things to reduce poverty around the country but just because he’s enacted positive change in that area does not mean we should ignore very troubling trends in others.